When viewing your monthly credit card statement, the items that stand out are the due date and minimum payment. However, you may be wondering if it's better to pay on or around the due date or several days beforehand. There are several things to consider if you're trying to figure out the optimal time to pay your credit card bill. The due date is the latest you should make your monthly payment to avoid late payment fees and keep the account in good standing. When you fail to remit at least the minimum payment by the due date, you will automatically incur a late fee between $25 and $35, notes NerdWallet. NerdWallet points out that payment history accounts for 35 percent of your credit score, so you definitely want to steer clear of late payments to protect your credit history. If the minimum payment remains outstanding for more than 30 days, it will be reported to the credit bureaus as a delinquent account. Furthermore, the negative mark will remain on your credit report for seven years. If you want to avoid paying interest, pay your credit card bill in full each month before the grace period ends. The grace period is the span of time between the date your billing cycle closes and the date a payment is due for the same cycle. "Paying your new balance in full by the due date triggers a break on interest on new purchases during the current billing cycle - if you pay in full consistently," according to CreditCards.com. Making multiple payments throughout the month can be ideal if you have a large amount of credit card debt and want to dig yourself out of the hole as quickly as possible. If you wish to make payments each time extra funds are available, go for it before the money is wasted on something else. Additionally, according to Credit Karma, making several payments each month can be beneficial to your credit score, "as it may help lower your credit utilization rate." You can go so far as to ensure your credit card statement or report never reflects a balance by remitting a payment immediately following each purchase. Regardless of which method you select, keep these factors in mind. 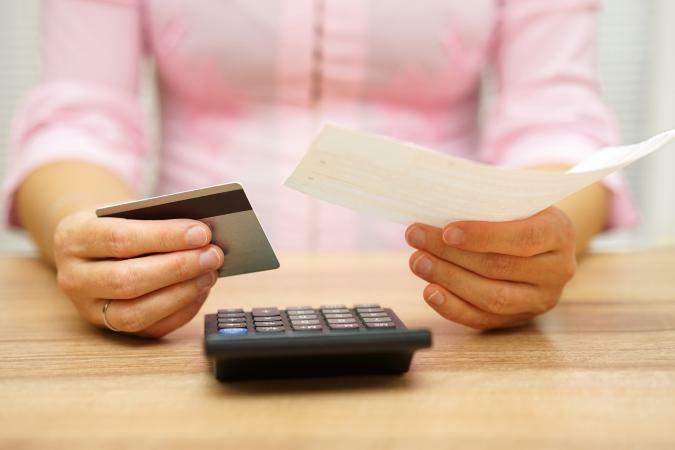 NerdWallet recommends keeping your credit utilization ratio below 30 percent. To illustrate, if you have a card with a credit limit of $1,000, you should keep your outstanding balance with interest below $300. Otherwise, your credit score could take a hit since the amount owed impacts your FICO score. Simply put, the percentage owed is far more important to your credit score than the total amount owed. Reach out to your creditors to find out when they report to the credit bureaus. You'll want to ensure your payment posts in time so your reported balance is accurate. Also, keep in mind that there may be a delay in the updating of the balance if you remit payment by mail since the check has to be received and applied to the account manually by the credit card issuer. If you're having difficulty making timely credit card payments because of your pay schedule or other financial difficulties, contact the credit card issuer promptly. They may be able to offer you another due date that better suits your needs.